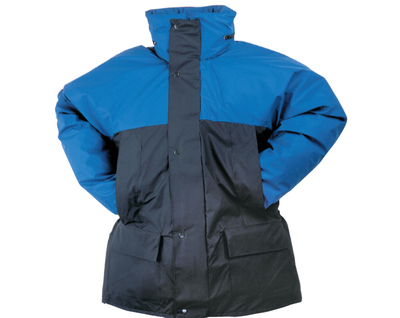 Flexothane breathable winter jacket with fixed padded lining, foldaway hood in collar, inside pocket, zip and stud closure, two lower patch pockets, two chest velcro closing pockets, elasticated back, high frequency wleded seams, knitted windcuffs. EN343 Class 3/2. If a logo is required, it must be ordered separately.